Summary: Bubba’s BHS-DA-20 wireless driveway alarm features a low quality PIR sensor that gets triggered by wind, sunshine or leaves. It may work fine as an indoor alarm, but if you’re looking to monitor your driveway, the Guardline GL2000 or the Dakota 2500 are more suitable. 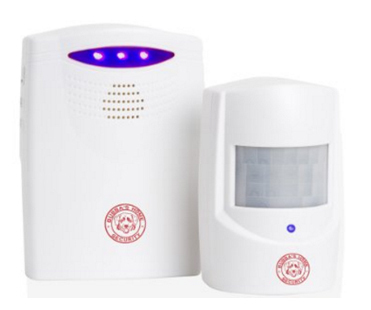 Bubba’s BHS-DA-20 model features a PIR motion sensor that will detect people, animals and cars. The alarm systems include 1 transmiter and 1 receiver. Batteries are sold separately (3 AAA batteries and 3 C batteries). Optionally, you may also purchase an adaptor for the receiver since this is not included in the package. When the PIR sensor detects movement, a signal will be sent to the receiver. You will then be alerted by either a sound, an LED light, or both. If possible, install the sensor in an area protected by heavy rain and wind. Bubba’s BHS-DA-20 wireless driveway alarm is an inexpensive alarm because of its inferior quality. Even though the alarm uses a PIR (passive infrared sensor), the sensor it’s cheaply made and false alarms constitute a big issue. As an alternative, take a look at the Guardline GL2000 if you’re looking for a driveway alarm that will detect people and vehicles. If you would like to be notified only when a car pulls into your driveway, I recommend the Dakota 2500.